Welcome to Day #3 of French Chocolate Theme Week. The consensus seems to be that the French invented the chocolate truffle in the 1890s. The word truffle is now applied to many different types of chocolate confection and/or filled chocolate or bar. But, to enjoy a true chocolate truffle in the original French tradition, I recommend paying a visit to XOX Truffles (San Francisco, CA). 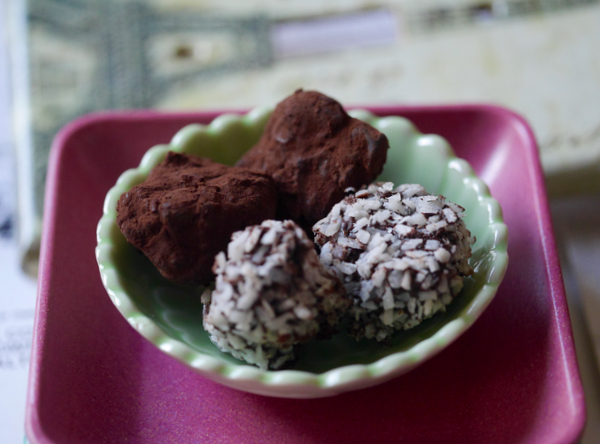 Today I'm featuring two more truffle flavors from XOX Truffles: Raspberry and Coconut. Gorce and his partner and wife Casimira N. Tobilla, founded XOX Truffles several years ago. 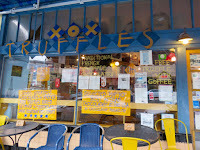 Their truffles can be found in a small shop in North Beach (San Francisco). *Chocolate truffles were named after a prized fungi that grows in the ground, due to their similar shape and appearance. Dogs and pigs are sometimes used to help hunt for truffles because of their more acute sense of smell. (Truffles give off a certain smell when they are ready to be harvested.) Fortunately, chocolate truffles are ready to eat and enjoy at any time.